Every Monday to Saturday in the early morning at 5:30 a.m., when it is still dark outside and the air is still a little fresh and humid from the preceding night time, Lone Chaw gets ready for his morning run in a nearby municipal recreation area next to the Kaba Aye Pagoda and a buddhist monastery. After a jogging run of approximately 5km, he continues with some really tough exercise which consisted of about 5 rounds of 100m in duck-walk, followed by 5 rounds of maximum-speed 100m sprints. After this stamina and springiness part of his morning exercise, he proceeds with a 10min stretching procedure before he starts his walk back home to continue training together with his coach Mr. 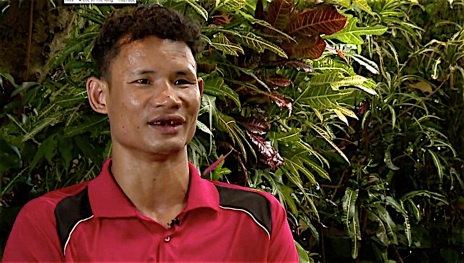 Win Zin Oo, whose one-family house with garden is located directly next to the apartment block Lone Chaw lives in. 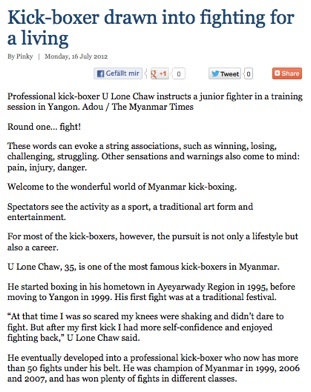 Besides doing his own work-out to stay fit for upcoming fights, a few years ago Lone Chaw started to teach some Lethwei and fitness-boxing lessons to a handful of expats living in Yangon. 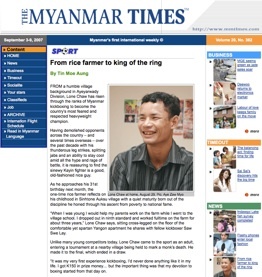 And although there were nearly no foreigners, living in or visiting Myanmar, who were interested in serious Lethwei training or sparring, Mr. 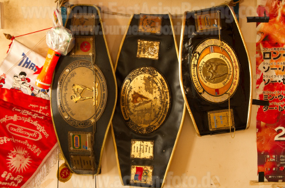 Win already started thinking about a „second career“ for his Ex-Champion: to become a professional trainer in his own gym, open to locals as well as to foreigners. Meanwhile, the situation has even changed to the better. In 2011, Mr. 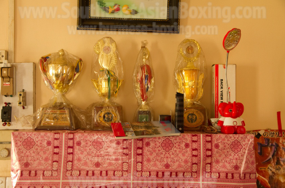 Win initiated a fundraising for the construction of a sheltered boxing-ring area in his garden, for the purchasing of new training equipment and for the annual rental costs of an apartment nearby, which has become the new home of three young Lethwei fighters from he countryside, who signed to Mr. Win‘s and Lone Chaw‘s new Gym to become top-level professional fighters. The construction of the new training area was finished by the end of 2012. 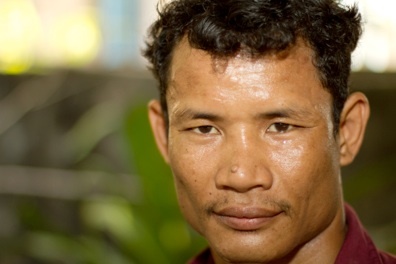 AndréRené, who also took part in the contributions for the new Gym, went back to Yangon in April 2013 to gain the latest first-hand information about the present training situation. 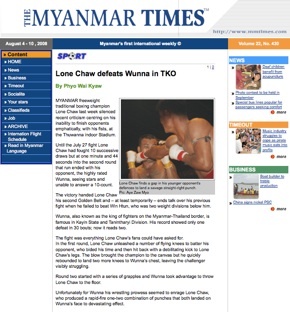 His report about this outstanding place of passion for the Burmese Boxing can be found following the links for Thut Ti Letwei Gym Yangon.